When will he find justice? Mehman Huseynov’s appeals for justice and freedom continue. The Court of Appeal has found Mehman Huseynov’s appeal groundless. His lawyers will appeal to the Supreme Court within one month. During his appeal hearings, the Court allowed Huseynov to give a statement, but rejected all other motions put forward by his lawyers. These motions included for the restrictive measures to be changed and Huseynov freed, for him not to be held in a cage, for the Court to investigate video evidence, and for the police chief who brought the case for defamation to testify in Court. The practice of keeping Huseynov in a cage is something that he and his lawyers have repeatedly protested against during all stages of the trial. Huseynov’s appeal hearings have been crowded with people – attended by embassies, civil society, media, and political parties, as well as family and supporters. Human Rights House Tbilisi trial observer Elena Fileeva (centre) with lawyers from Mehman Huseynov’s defence outside the hearing on 3 November. The following was published on 29 September 2017 following Mehman Huseynov’s Supreme Court hearing. It was not made clear during the hearing why the Supreme Court itself did not make a decision on the case – according to a trial observer from Human Rights House Tbilisi. In commentary to the Azerbaijani media, his defence stated that it does not agree with today’s decision. “Mehman Huseynov works bravely and passionately to expose inequality and corruption, and to draw attention to issues Azerbaijanis face in their everyday life. These are issues the authorities should be addressing, not trying to remove from the public space through repression,” commented Maria Dahle, Director of Human Rights House Foundation. “Mehman Huseynov’s humour and innovative approach reaches the consciences of many and helps to stimulate a social discourse. The charges against him have sought to take away his important voice, and have caged a young man seeking to inspire positive change for citizens in his society,” she continued. Many from the international community have called for his release, as have campaigns and protests from civil society. September marks six months since the Azerbaijani journalist was imprisoned on charges of defamation. In recent weeks, the Azerbaijani authorities seemingly responded to international scrutiny by releasing Mehman Aliyev, the director of Azerbaijani independent news agency Turan. On 2 November, all charges against Mehman Aliyev and Turan newsagency were dropped. On 3 March 2017, Mehman Huseynov was sentenced to two years in prison for defamation. This charge is based on his reporting that he was tortured while in police custody – a situation he found himself in after being abducted in Baku by unidentified assailants and taken to a police station. He was later released and charged a fine of 200 AZN (around 100 euros) for disobeying the police, before later facing a charge for defamation pursued by the chief of the police station. HRHF also pointed to the absurdity of it being illegal to resist one’s own abduction, in an op-ed for Meydan TV. Mehman Huseynov was not able to attend the hearing at the Supreme Court. He put forward a motion requesting to personally participate in the court proceedings, but this was rejected by the Court. During the hearing, Mehman Huseynov’s lawyers stated that under the Azerbaijani criminal code, defamation is only possible against a physical person, and that Mehman did not mention names or personalities, so committed no crime. This complaint was partially satisfied by the Supreme Court. His defence further declared that freedom of expression is guaranteed under the Constitution of Azerbaijan and the European Convention on Human Rights. The lawyer for the prosecution noted that Musa Musayev (the police chief that brought the case for defamation against Mehman Huseynov) has full rights to defend his honour and dignity. The lawyer added that freedom of expression is protected in Azerbaijan like nowhere else. This statement reportedly caused contradictory comments and reactions by those attending the hearing, according to the trial observer. Mehman Huseynov’s detention and sentence are widely seen as retaliation for his work as a journalist. In December 2016, the month before he was abducted, he shared a video in which he contrasted the financial difficulties of elderly citizens with the “palaces” built by members of the government. And just three days before he was sentenced in March, he published a video in which he asks men on the street whether they would make their wife vice-president if they were president of a large company. The video contributed to the public debate around President Ilham Aliyev’s decision on 22 February to appoint his wife to such a position. On 12 April 2017, the appeal Court upheld Mehman Huseynov’s conviction, after a three-day hearing in which his defence lawyers argued that the court of first instance had failed to examine case materials altogether. They argued that the Court had only looked at the complaint from the head of the Nasimi Police and Mehman Huseynov’s statement, and rejected requests to question witnesses and check video footage. The Court of Appeal supported these decisions. Previously, on 29 March, the Appeal Court rejected all motions by the defence related to procedural elements, such as requesting for Mehman Huseynov to sit with his lawyers and not be held in court in a cage. 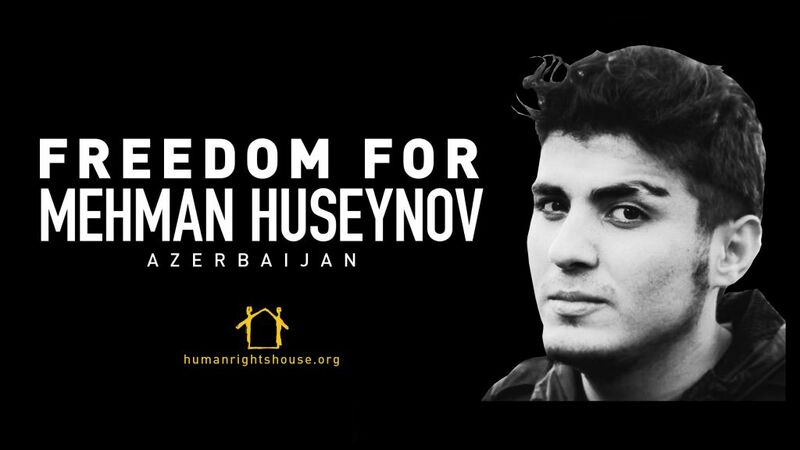 Mehman Huseynov is far from the only journalist in Azerbaijan to be targeted for their work. As mentioned, Mehman Aliyev was recently detained, and charged for illegal entrepreneurship, tax evasion, and abuse of power. His organisation Turan faces a criminal investigation for tax evasion. In July 2017, the editor of opposition Azadliq newspaper, Faig Amirli (conditionally released on appeal), was sentenced to three years three months in prison on charges of inciting religious hatred and tax evasion. Azerbaijan allegedly spread its attacks on journalists beyond its borders in May 2017, abducting journalist Afgan Mukhtarli in Tbilisi, Georgia. The European Parliament has condemned his abduction. The Baku Court of Grave Crimes convicted Khadja Ismayilova on politically motivated charges connected to her work as an investigative journalist in September 2015. She was first arrested in December 2014. Ismayilova linked the authorities’ targeting of her to her investigations into the business interests of President Ilham Aliyev’s family. She was released in May 2016 facing 3.5 years on probation, and a two-year ban on professional activities. This persecution is all part of Azerbaijan’s ongoing crackdown on independent media. In addition to bringing criminal charges against journalists and their organisations, this crackdown also includes forcing international media out of the country, and blocking the websites of Azerbaijani media in exile.